Please enter the date you'd like this item by. If it earlier than 10 business days please confirm with me first. Without this your order might not process. **Please read Announcement/shipping policy before purchasing. I need you to enter a "need by date" in the note section before checking out. 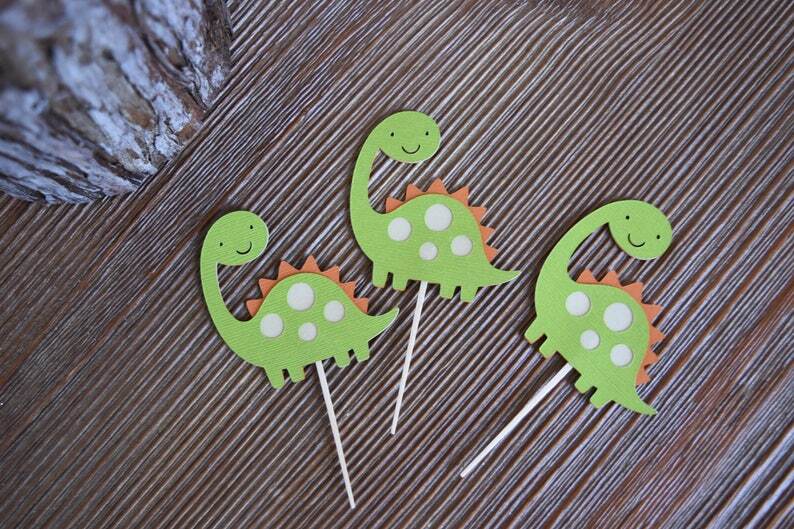 High quality Cupcake toppers (with Toothpick), these are made with four layers of textured card stock. If you would like to mix and match with other designs or color combinations, shoot me a message and i will create a custom listing. You will receive 12 of the same green dinosaurs unless you choose the 6 of each option to receive the purple ones too. They arrived timely and are even cuter in person than I imagined! Can’t wait to use them for our 1st birthday party!! The seller was very responsive and was able to help me in a pinch by getting product to me within days. The product arrived in perfect condition and got so many compliments. Buyers pay at order time. We put much pride in our work, especially custom orders. We want to make sure you really want the product, therefore start after payment has been cleared. Refunds will be done until we receive unused item, just return to sender. Refunds DON'T include shipping cost. Shipping will be refunded if there was a fault on my part. Note: refund status will be negotiated in a conversation first. Turnaround estimate is usually 5-7 business days (Mon-Fri) , depending on what was ordered (check shop announcements for temporary changes). Everything is made to order and is handmade. If we have ready to ship items they will ship out the same day. PLEASE state in the Note section the need by date (not event day) to ensure you get your items on time. By giving me your date it will ensure you get your stuff on time. This is VERY important. I will not be responsible for "late" items if you did not provide a date. USPS packages have been having many delayed statuses lately so please plan for that. -We offer First Class and 1-3 Days Priority shipping methods (Processing times are still 5-7 business days). -Message me for overnight shipping and Rush orders. -I may make have time for rushed orders so shoot me a message to see if it's possible. We can customize most of our products! If it is just color changes or characters you see available in the store already, just lets us know in the note section at checkout. There is no need for a custom request. Only if you want to add features or amounts. Just let us know.